Anyone who's lived life, knows the universe can change things in a second, minute, hour...or two hours. 5 AM Old Royal, 40 Years old, was happy, whinnying to get his new hay, drinking his water, and anticipationg getting his grain. 6:45 AM, he is down and cannot get up, and though old, until that moment he was not having a problem getting up. In fact the day before I had brushed him getting all the mud off from him playing in the mud. He struggled, he fought, he hollered because he was mad he could not get up and try with all his might...it didn't happen. 8:30 AM the decision is made because knowing this horse as I did... if he's not getting up, that means he cannot...9:30 AM...Old Royal is put to rest. Later that morning, and the universe again was kind becasue Rick was home for just one day before leaving for Nevada, we were talking and laughing about things Royal had done in the almost 30 years he lived here...when I was directed to read a page in my journal, and that page dog earred for what ever reason, was from two years ago, gave conformation the decision to put him to rest was correct.
" Today was proof, if the day ever comes, that Royal cannot get up will be the day, he is to be put down, because no matter what, if he can he will, no matter how old he is, I know he will always have the heart and mind to get himself up... this is just the way he is... a fighter. I am to remember this, if there comes a time Royal struggles to get up and cannot...it will be time. " We don't know what happened, it wasn't colic, it was far to quick. We figure something drastic inside must have happened, like an anuisum or a rupture. We are sad, but greif there is none. Royal had a good long life...and we were previeldge we were choosen to have this magnificant horse. I purchased him for my husband for his birthday back in the early 80's, when we had gone to haul a horse for someone else, and by 'chance' we saw this beautiful horse in the killer pen. Killer pen meaning, going for slaughter. Going for slaughter because he'd bring a good dollar. It was sad one reason he was in the killer pen he was, fat, shiney, meaty, and meat prices were high. But he was also in there because he was an untrained,10-12 year old stallion with a lot of energy. It was about 3 days after we saw him and my husband kept saying over and over..."I really like that horse . 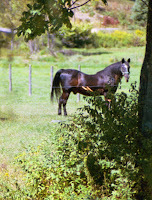 That horse is special..I really like that horse" m,,,that,, th that I called, hoping I wasn't to late to have the guy take him from the killer pen, and I hooked the trailer up and with $400 in hadn, I ran over and brought him home as a surprise for my husband. Thus, Royal came here to live and be one of the best horses we ever owned. A horse with the most heart of any horse that's graced this barn. He was like a wild Spirit that was the epitamoey of he allowed us to ride him. You know like in the movie, The Man from Snowy River, the stallion that let the young man ride him...that was Royal. So when people say, my you are handling this well...I tell them, I am not sad really about his passing, it was guick and he did not suffer... I am grateful that we were blessed to have him as part of our life and to be able to share and feel his 'spirit'. There are many good memories of the horse from the killer pen, for both Rick and I, but one of which when he'd be out in the pasture, I'd stand along side of him, grab his mane, and we'd run, together through the grass, moslty it was I had to hang on tight, because he'd wisked away above the grass on the air of his spirit and he would show me what it was like to be able to run like the wind, then stop and let my feet touch the ground again.